Congratulations! Growing and having a baby are important life events for a woman and her family. Every pregnant woman and every newborn deserves respectful, knowledgeable, and skilled care that values them as individuals. 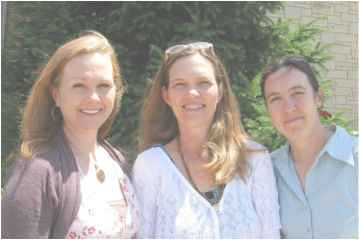 Kim James CPM, Sarah Davis CPM, and Dawn Finney CPM are three of the most experienced Certified Professional Midwives in central Missouri. For the past six years, they had a collaborative arrangement and enjoyed assisting each other in the care of their clients. Starting in 2018, however, Kim James and Sarah Davis have closed their practices. Midwifery care and home birth services will still be offered by Dawn Finney. Please visit the "Meet the Midwives" page for more information about this change. Dawn Finney invites you to explore the information and services she offers on this website or on her individual practice website: Birthroot Midwifery. She welcome all questions and inquiries. Schedule a free consultation today!